Today at its September 7 media event, Apple announced a new Mario game is coming to iOS, called "Super Mario Run." In the game, Mario runs to the right, and users can tap to make Mario jump. Later levels will introduce blocks that change Mario's direction as well as other more intense obstacles that require precision timing, but the goal remains simple - collect as many coins as you can and get to the flagpole at the end of the level before time runs out. All the while, users can play the game one-handed. There are a few other modes too, including a battle mode called "Toad Rally," which lets users compete against the ghosts of friends and strangers around the world and beat their high score. Victory in battle mode depends on the number of coins you collect and the number of toads you impress, since the toad characters appear on screen every time you perform a daring move. There's no flagpole in battle mode, so the player keeps running until time runs out. The ghost appears in the level to show the player what the person they're competing against was doing when they ran the same level to achieve their score. We want as many people with smartphones around the world to enjoy playing as Mario, and we're doing it first on iOS. And we're doing it in a brand new game called Super Mario Run. The magic of Mario is that anyone can pick up a game and instantly start playing. This time, we've made it even simpler to begin. As the title suggests, Mario runs automatically to the right, and as he does he'll hurdle small gaps and certain enemies. It's very simple and the movement feels great. With just a tap of the finger anywhere on the touchscreen you can make Mario jump, and the longer you tap, the higher he jumps. This is key to getting high scores. Being able to play one-handed means you can do so while holding onto a handle on the subway, while eating a hamburger, or while eating an Apple! No further details about the price were revealed, but Shigeru Minamoto confirmed that the game would not be free-to-play, and come with a one-time, set price point. The game is expected to launch sometime this holiday season, and Nintendo is also launching a Super Mario sticker pack for iOS 10. 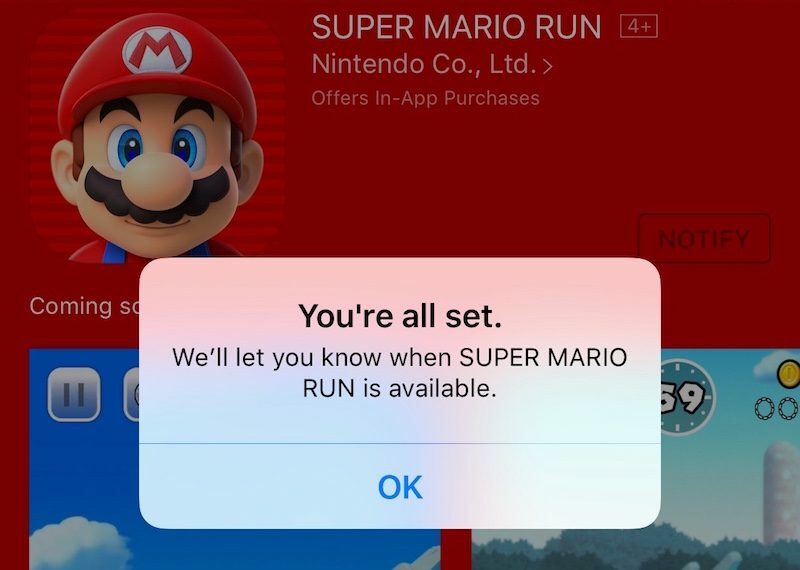 Update: It was discovered earlier today that Apple is trying out a new "Notify" system with Super Mario Run, where the App Store will let players know when the game becomes available to download. Nintendo and Apple belong together. It just feels right. They got Miyamoto on stage. This by itself is a huge endorsement by Nintendo. Miyamoto is a living legend among video game designers. Shigeru Miyamoto games include: Mario, Donkey Kong, Legend of Zelda, Star Fox, Super Mario Bros. I hope Nintendo brings these games to macOS too. At the very least it will help spark a small boom in "casual Mac gaming". Love it! One-time pricing is a relief & hopefully a sign of what's to come from everything nintendo on iOS. But will it run on TVOS as well? I've been saying for years that Nintendo should have gone all-in with Apple on mobile (maybe even TV) gaming, so while this is really late to the game, I'm optimistic it'll help the company survive. That said, I can't stand endless runners, so I have zero interest in this game. Give me a carefully-crafted platformer experience, though, and I'm all over that. True platformers are better suited to a Mac/PC, or even the TVOS. They would be clunky controlled on a touchscreen mobile, that's why endless runners are everywhere on mobile because the runners require simpler controls/movement. If you want. I'm all for devs getting paid for their work. And, those new Marios aren't emulated yet. Automatically run to the right and jumps when the player tap the screen? Feels like the chrome offline game? Hmm.. Am I the only one that's really disappointed? A damn one-tap running game like 1000 other games? I don't get it either. Is it just the Mario character that people are excited about? This game looked supremely boring during the keynote. Nice to see Nintendo bring their signature character to iOS. This is a game I'm likely to buy and have long term fun with (I hope).